Up for something a bit different? 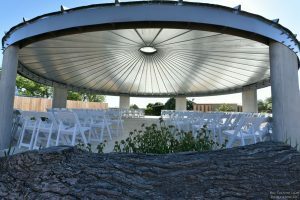 How about a wedding in the round? Instead of the usual rectangle of chairs with an aisle in the middle, why not be surrounded by your guests? There’s something formal and distancing about being confined to the back of the event. But there’s something warm and inclusive about surrounding it. Imagine yourself and your beloved in the center of our beautifully serene gazebo, surround by your family and friends. No one would be more than 20’ away. This nearness allows for much better views and a much more intimate experience, since it’s natural for people to surround an event to get a better look. Wouldn’t it be more fun (and more memorable) to have your ceremony in the center of your loved ones? They’ve come to witness your marriage and share in your happiness; why not give them the best view possible!